Nestled in amongst some of Britain's most beautiful green countryside, Bath is famed for its Roman Baths, stunning Georgian architecture, and buzzing music / arts scene. The Romans were the first to take advantage of Bath’s natural hot springs, using them as a thermal spa which still stand strong today (pictured). Bath was then developed into an elegant spa city in the 18th century when much of its impressive architecture was built, including the renowned Royal Crescent and Circus. Visitors tend to get caught up in Bath's magical charm, including writers like Jane Austin, Charles Dickens and Mary Shelley, who all drew inspiration from the beautiful surroundings. You may be visiting Bath to see some of these sights, to absorb some local culture, or to take advantage of the huge number of quirky and independent shops. Either way if, like me, a highlight of any trip away from home revolves around trying lots of amazing plant-based food and getting inspiration for new vegan dishes, then you certainly won't be short for options in Bath. In fact, you'd be hard-pressed to try all of the options if you were visiting for a week, let alone just for the weekend. That's why I've put together this guide to the vegan and vegetarian restaurants, cafes and shops in Bath. Hopefully it'll help you decide which places to try, or it may just inspire you to give Bath a visit, which I assure you won't be a disappointment - both for the incredible vegan food and for everything else this wonderful city has to offer. The Green Rocket Café is a well established plant-based restaurant, right in the heart of town, with beautiful views of Bath Abbey and Parade Gardens. This multi-award winning independent restaurant has a very relaxed vibe, but hard at work down in the kitchen are very talented chefs creating an array of sophisticated yet hearty food, all from scratch. Famed for their vegan and veggie breakfasts, they also serve up aromatic coffees, delicious lunch and homemade afternoon tea every day. And from Wednesday to Saturday they're also open for dinner in the evenings - this is my favourite time to come as the chefs really get to show off their talents. Options include their smoked mushroom, chestnut and sage sausages with mustard mash, gravy, wilted spinach and onion rings - a wonderful vegan take on a British classic (pictured). Or their rich and fragrant Vietnamese coconut curry bowl with fresh vegetables, tofu, jasmine rice, and pickled vegetable salad (pictured). For dessert you could try their vegan sticky toffee pudding with ice cream, rich chocolate torte with honeycomb and ice cream, or their home made raw cheesecakes with raw almond cream (pictured). 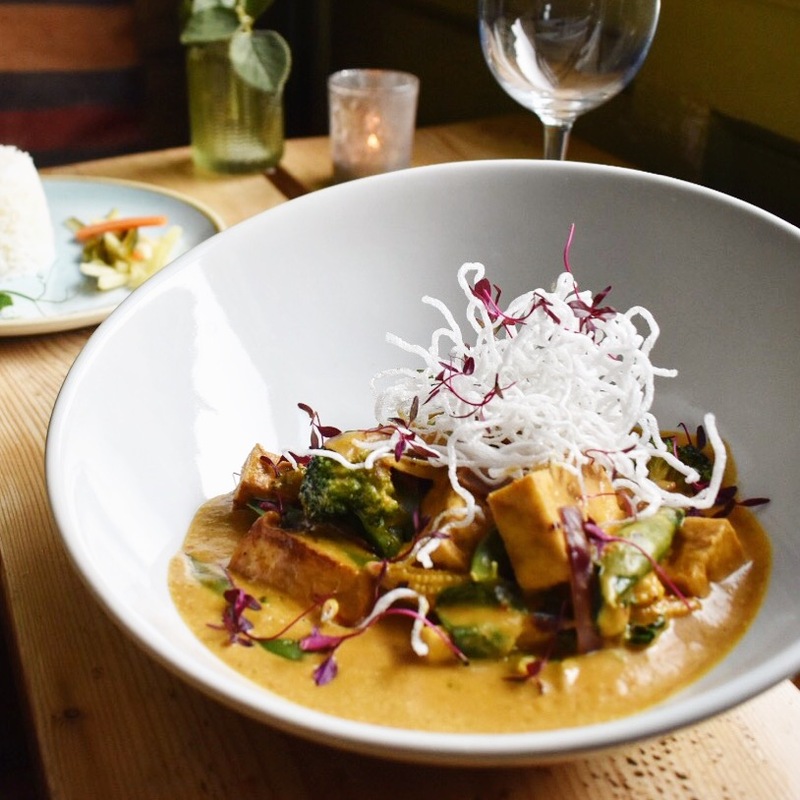 Nourish is a relative newcomer to the Bath vegan restaurant scene but they've made quite a splash by serving up incredible food that's been proven to please even the staunchest of meat eaters! Based in the Larkhall area of Bath, they serve up international cuisine with influences from all over the world, with everything cooked from scratch in their kitchen using seasonal vegetables and supporting local suppliers where possible. Why not try their take on Chinese 'duck' pancakes, made with braised tofu in a thick and sticky hoisin sauce (pictured). Or their vegan take on a British classic, 'fish 'n' chips', made with beautifully flaky banana blossom (Google it - I had never heard of it before!) in a crispy batter with a touch of seaweed to give it a subtle taste of the ocean, and served with chunky chips, vegan tartare sauce and smashed minted peas (pictured). Open for dinner Tuesday-Saturday and lunch Friday-Sunday. Indian Temptation could easily be missed, because the restaurant is on the first floor and the small entrance is a little tucked away. But be sure not to miss this gem - especially if you love Indian food - because it's a favourite among the Bath locals who keep coming back for their delicious home made vegan and vegetarian curries. 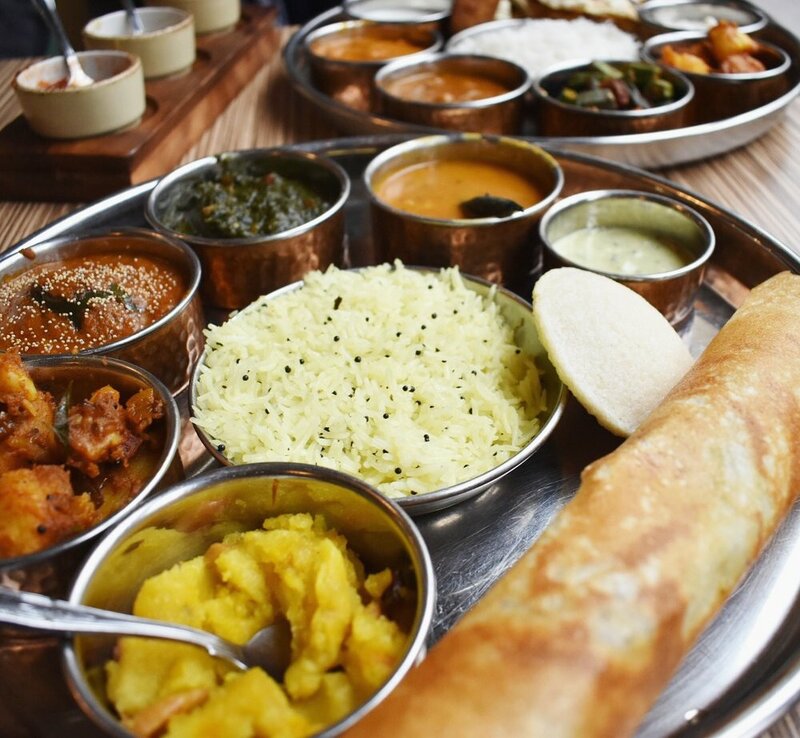 You can order the more traditional curry options or, if you like to try a bit of everything, you can go for their famous vegan thali (pictured) which comes with a beautiful selection of curries, dhal, vegetable side dishes, dosa, and a dessert! And with that view of Bath Abbey (which becomes even more stunning when lit up at night) you have a pretty enviable backdrop to enjoy your food against. Acorn is a magnificent restaurant in the centre of Bath, where you can enjoy modern gourmet food and watch how top quality fresh vegetables can (and should) take centre stage. Set in a historic Georgian building, Acorn opens for lunch and dinner every day so you can enjoy some sophisticated dishes such as their starter of 'old donkey carrots', which are cooked slowly then fire charred and served with pickled carrot, parsley puree, carrot and cashew puree, and seeded spelt grain (pictured). For main course you might enjoy their ingenious whole cauliflower which is broken down and cooked in various ways (roasted florets, truffled puree, pickled core, sauteed leaf, fenugreek and onion croquette, spelt grain and tarragon oil). Their vegan chocolate and coffee parfait with chocolate ganache (pictured) is a dessert you'll dream about for years to come. If you can't decide what to order you can go for their five course tasting menu and can even opt for the wine matching if you'd like to try delicious fine vegan wines that are paired with each of the courses. Chaiwalla serves up Vegan Indian street food in the centre of Bath. It's a small shop-front so it could also be easily missed, but the incredible smells wafting from their tiny kitchen where everything is made are sure to stop you in your tracks and drag you towards their food in a trance-like state, just like in the old cartoons. You could grab some channa dhal (vegan lentil curry served with rice) or their samosa chaat - a classic Indian street food dish made with a samosa broken down and immersed into a chickpea curry, covered with fresh onions and tamarind, sprinkled with chickpea rice noodles. Or my favourite are their wraps - filled with either their fresh hot Indian falafels or their onion bhajis and packed with salad, mango chutney, and tamarind sauce. They're open every day for lunch from 11.30am until 5pm (4pm on Sundays). Beyond The Kale make everything on the premises near Bath’s Green Park Station where you can get a range of salads, quiches, wraps, and cakes which are all vegan, with many gluten free options too. They open every day for breakfast, lunch and afternoon tea. For lunch, a delicious, healthy, and surprisingly filling option is their fresh salad plate, where you get to try a selection of their raw and cooked salads, roasted vegetables, homemade hummus, vegan pesto, and a tomato and garlic dressing. Or if you want something to take on-the-go, try their falafel wrap (pictured). It's no ordinary wrap - their homemade falafels are insanely good plus they're packed with quinoa tabbouleh, fresh salad, homemade slaw, and a sweet chilli and tahini sauce (the soft wheat wrap is toasted too which takes it to another dimension). A new (and seriously amazing) addition to the vegan scene in Bath is Cascara - a vegan cafe serving up breakfast, lunch, ridiculously good homemade cakes, smoothies, juices, and speciality tea and coffee. Positioned right in the heart of Bath, it’s the perfect chance to escape from the hustle and bustle of the city so you can truly relax and indulge your taste buds. You’ll be greeted by super-friendly staff, a relaxing cosy atmosphere, and some incredible vegan food and drink, like their famous kimchi and cheeze toastie which you could eat in or take with you to meander round the shops with. Sky Blue Cafe is an independent family-run business serving delicious hot and cold food, indulgent cakes (all made freshly on site) along with artisan coffee, speciality organic loose leaf teas, and freshly made juices and smoothies from their juice bar! They're nestled beneath the Chapel Arts Centre where you can go to watch some live music, comedy, or maybe even a burlesque show! So you can grab a pre-gig bite to eat and/or drink from this proudly 100% vegan cafe beforehand. It's also right next to the Southgate shopping centre in Bath, so if you need a break from your retail therapy, pop in to rest your feet in this peaceful haven and enjoy some tea and one of their home made vegan cakes, like their raw vegan brownies, or their out-of-this-world carrot cake (pictured). You can now get incredible vegan food and drinks as soon as you step off the train into Bath - because Roots and Shoots has just opened up a stone’s throw from the station! Or if you’re upset about leaving, you can at least make the journey a joyous one by grabbing a fresh coffee and a some delicious homemade vegan food to take on the train with you. One of their ‘facon’ butties or a selection of vegan pastries will set you up for the day perfectly, or if you’re in town (it’s also very close to the Southgate shopping area of Bath) then have an incredible lunch - salad boxes, vegan man ‘n’ cheese, wraps, soups and stews have all tastes covered, or if you’re feeling indecisive go for a ‘taster box’ so you get to try a bit of everything! While you're in Bath do you fancy learning how to cook some amazing plant-based dishes to expand your repertoire and impress your friends when you get home? Well, Demuth's has you covered. They run cooking courses and day (or half-day) classes ranging from Asian street food and Ethiopian cooking, to bread baking and seasonal salads. Taught by experienced chefs in their modern, spacious and inviting kitchen, all their classes are vegetarian and many are vegan with some raw and gluten-free options too. They even run vegan diploma courses throughout the year if you really wanted to improve your technical abilities, or if you're visiting Bath with a group you can book the school for the day and choose whichever course you like! If you're staying in Bath and need some supplies, then Harvest will come in very handy indeed. They sell all sorts of food, drinks, store cupboard staples, frozen foods and they even have an awesome deli selling vegan and vegetarian stews, sandwiches, pies and cakes. Everything in the shop is vegetarian with the majority being vegan, and most products are local and ethically sourced. Harvest is a worker-owned cooperative, and their ethos is to provide ethically assured, healthy and fair trade produce with many local artisan products which can make the perfect gift to bring back for someone from your trip to Bath! To wash everything down? Well if you enjoy a tipple, then Beercraft of Bath has a great selection of vegan beers and ciders. The staff are super helpful too and happy to tell you which beers are vegan. My favourite they stock has to be Electric Bear which is brewed in Bath, and the head brewer is himself vegan, so the vast majority of their beers are vegan friendly. Plus their branding is super-cool, which to me is half the fun of choosing a tasty beer! Mission Burrito is an independent chain of Mexican restaurants, making ridiculously good burritos with fresh ingredients from scratch every day. They do serve up meat but they're definitely worth a mention in this article because they have some awesome vegan options, and unlike many burrito places I've been to, their rice and guacamole are both vegan. So their vegetarian burritos, tacos, rice box and salads are all vegan friendly. Watch out for their vegan specials too - their black bean and butternut squash chipotle chilli burrito (pictured) was so popular that they now put it on for the first week of every month! The Stable is another place that does serve meat, but I couldn't miss it out of this article because they have a dedicated vegan menu which has some mouth-watering options. 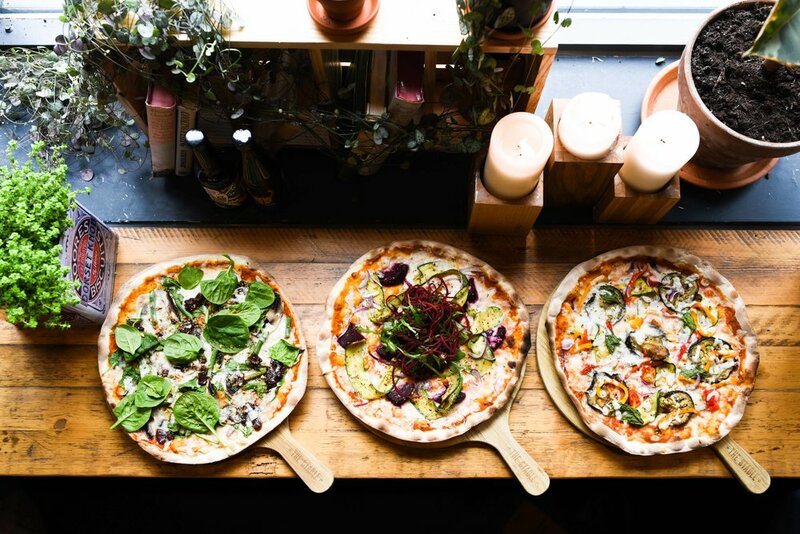 And you can tell these vegan options weren't just an after-thought as they often are in many restaurants - options include 'heart skipped a beet', 'the good life' or 'hazelnutter' (pictured) which are all made with their famous sourdough bases, rich tomato sauce, fresh local vegetables, and vegan cheeses. They even have awesome vegan puddings such as their rich brownie with raspberry coulis, or tender cider poached pear, both served with vegan ice cream. Yak Yeti Yak brings a taste of authentic Nepalese cuisine to the UK in this relaxed and informal independent restaurant in the heart of Bath. If you haven’t tried Nepalese food before, expect a beautiful, fragrant hybrid of Asian influences, with many dishes having Indian, Thai and Tibetan origins. And there's no finer example than Yak Yeti Yak, who take pride in cooking their Nepalese cuisine to perfection: everything is freshly home cooked, with the talented chefs bringing their years of experience cooking in Nepal to treat us to some classic dishes (and family favourites) here in Bath. They do have meat on the menu, but as traditional Nepalese food tends to be vegan, naturally some of their best dishes are plant-based. Try their incredible vegetable momos, Nepalese-style spiced dumplings which are one of the most popular foods in Nepal. Their musurko dal is also a must - orange lentils cooked with mild spices, then refried with garlic-infused vegan ghee. And you can't go wrong with any of their freshly made vegetable dishes, which are cooked to order so you can tell them how spicy you like them! Or if you don't have time for a sit-down meal, try their sister establishment - Phat Yaks in Kingsmead Square - serving equally delicious Nepalese street food from their cafe / takeaway. Their vegan menu includes 'curry in a hurry' or build your own vegan wrap filled with crispy vegetable Nepalese fritters, a bean and cumin pate, pickled slaw, and your choice of sauce such as their garlic chilli confit. And you can even choose a vegan lassi (mango or banana are favourites) to wash it all down. Had a lovely vegan meal at one of these amazing Bath restaurants and now looking for something sweet to round off your day/evening? Seriously guys, just make sure you head to Swoon (trust me, you won’t be disappointed). They have a delicious range of vegan sorbetti which are all so rich and creamy that you might not at first believe that they are in fact vegan! The trick to getting them so smooth and flavoursome is using the freshest ingredients, and churning that little bit slower to make them even creamier. Swoon is a small independent establishment with just two outlets, in Bath and Bristol. All of their sorbetti and gelatos are made by their talented chefs on site and I’m not at all surprised that they’ve won several Great Taste awards. They have two permanent vegan sorbetti flavours on the menu - rich dark chocolate and vibrant mango. Then they have guest flavours each month, so there are always several vegan sorbetti to choose from (don’t worry, they’ll let you taste a couple before you choose). Guest flavours have included pistachio (using the best Italian pistachios from Bronte), raspberry, pear, and blackberry with lavender. I like to get experimental by combining flavours - great combos include the dark chocolate with pistachio, or the raspberry with mango. Bath always has new shops and restaurants popping up, so if I've missed any or if something opens that you think should be included in this guide, send me an email and I'll check it out! Planning a trip to London? Check out my reviews of the vegan food available at the famous Borough Market and Broadway Vegan Market!